The image, posted on Facebook and shared multiple times on WhatsApp, is from 2012 when the Congress-led UPA was in power. 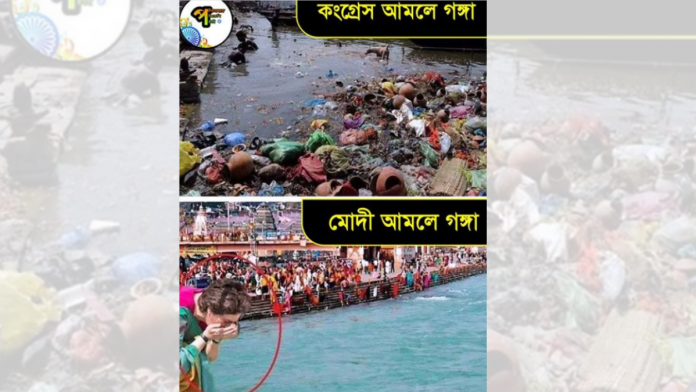 New Delhi: As Congress general secretary for Uttar Pradesh (East) Priyanka Gandhi Vadra concluded her ‘Ganga Yatra’ Wednesday, a collage claiming Prime Minister Narendra Modi’s success in cleaning up the river went viral on social media. The collage, posted on Facebook on 20 March, shows two images of the river — a filthy Ganga and a clean Ganga. The collage shows that while under the Congress regime the Ganga was dirty, under the Modi dispensation the river is all cleaned-up. A picture of Priyanka drinking water from the clean Ganga was also superimposed on the collage. The picture was posted by a page named ‘Chowkidar Samarthak’ @namosupporters.bengal. The irony, however, is the image showing a cleaner Ganga under Modi rule is from 2012 when the Congress-led United Progressive Alliance (UPA) was in power. The image has more than 4,000 shares and 14,000 likes. It has also been widely circulated on WhatsApp. As part of her Lok Sabha election campaign, Priyanka had taken a three-day ‘Ganga Yatra’ from Prayagraj to Varanasi, the parliamentary constituency of Narendra Modi. The collage comes close on the heels of Uttar Pradesh Chief Minister Yogi Adityanath’s comments that Priyanka should thank the Bharatiya Janata Party-led government for her ‘Ganga Yatra’. “It would have been nice had she taken Rahulji and leaders of the Samajwadi Party (SP) and Bahujan Samaj Party (BSP) along on her ‘Ganga Yatra’ and thanked Prime Minister Narendra Modi and his ‘Namami Gange’ project, which has made travel across the clean Ganga possible,” Adityanath said on 19 March. ‘Namami Gange’, run by the National Mission for Clean Ganga, is one of the flagship initiatives of the BJP government. The programme aims to clean up the river by 2020. However, the BJP has repeatedly been criticised for not completing the mission yet. Despite PM Modi auctioning his mementos to help raise money to clean up the Ganga, the government has been at the receiving end of constant criticism from the opposition parties for shifting deadlines and slow movement on the project.